The surf scoters have arrived. 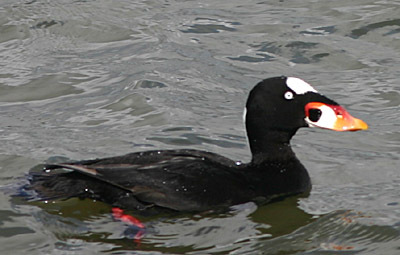 Burly black sea ducks with fat orange beaks and bold white mohawks, they dive one by one in rapid sequence and then pop up again like arcade ducks. They cluster above the sandbar and swallow mussels whole. A few sleek grebes dive with them and sometimes they surface with little fish pierced on their long dangerous beaks. The ragged-crested mergansers don’t socialize with the scoters; they hang out near the spit with the gaudy harlequins. The loons are wearing fall brown. The little bonaparte gulls’ heads turned from black to white and then they up and flew south. I miss their choreographed swoops and their pure un-gullish voices. I am not a bird geek but I am a bird nerd. My special birthday gift to me was binoculars and now I sit for hours on the bluff above the lagoon, just observing the birds and the otters and seals. Sometimes it feels like my life’s work to do just this. Someone’s got to keep an eye on the birds, might as well be me.